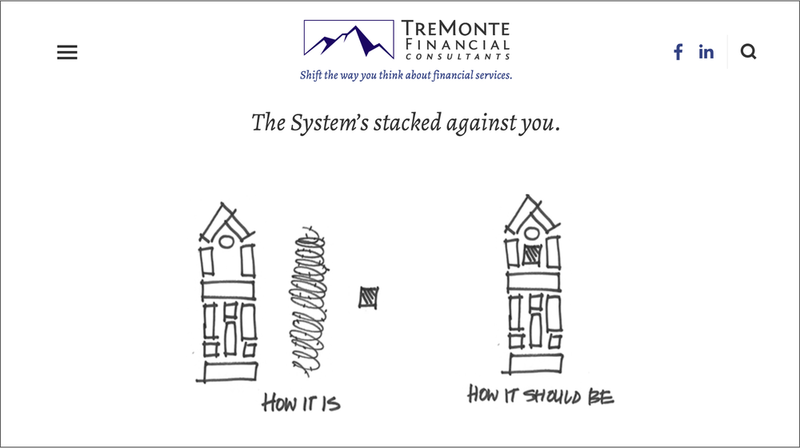 Financial services – with a twist. To be honest, we didn’t really anticipate writing or designing this site. But we sat down with Derek, the founder of TreMonte Financial Consulting (TFC) because we’re his clients. He started talking about his new business concept and how he’s designed it to change the experience of delivering financial services. Sooo … that sounded like something we wanted to be a part of. We talked about how other financial firms do business, and barriers that exist for consumers. Then we discussed how we might position his firm differently than other financial advisors using language that people understand, rather than copy that’s pasted directly from the Corporate Brain Trust. And instead of junking it up with meaningless stock imagery of wealthy people on sailboats and beaches, we captured Derek’s point of view with quick sketches that describe basic financial concepts. Because seriously, financial consulting is more about the process than the outcome. Check out the site. Then set up an appointment with Derek!